A Rockwood Manor Wedding provides brides and grooms with a variety of choices that allow them to make their wedding day a beautifully unique experience. The iconic Rockwood Manor was built in the 1920s and originally served as the country estate of Carolyn Gangwer Caughey. The manor has since become a prime location for events, and is ideal for both indoor and outdoor wedding ceremonies and receptions. The magnificent home is nestled in 30 acres of forest and is easily accessible from downtown Washington, Bethesda, and Northern Virginia. Weddings here are truly enchanting, especially those that are set outdoors. Outdoor ceremonies can take place in the estate’s secluded Flagstone patio area with its Grand Bridal Entranceway or they can be held in the perfectly manicured Gazebo Garden. This picture above shows the beauty of an outdoor Rockwood Manor Wedding ceremony. 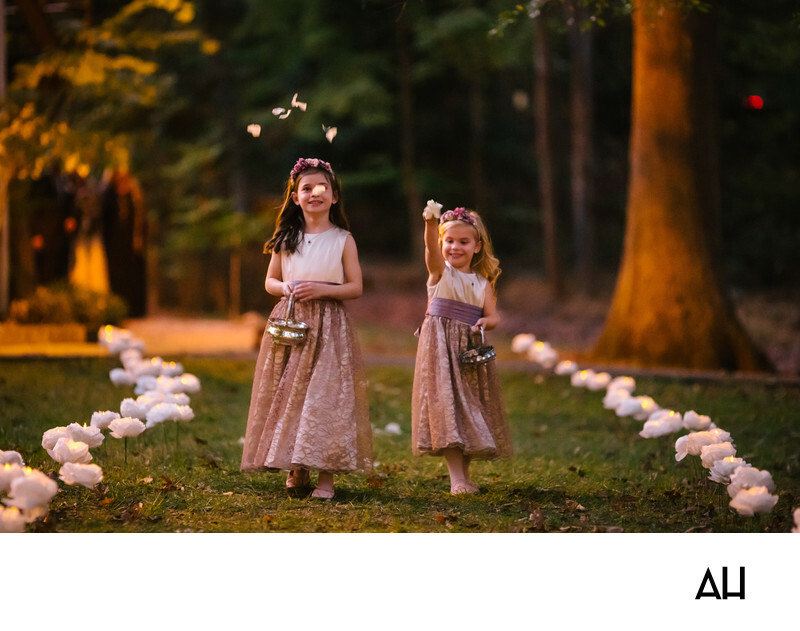 In the image, two flower girls toss petals into the air and watch them rain down on the grass. The girls are clearly excited about their role in the day. Huge smiles spread across each girl’s face, as giggles escape their lips. The aisle is a carpet of green and is lined with white flowers. Each flower glows from the center, almost as though the buds have been touched by magic. Fallen leaves crunch under the feet of the two little girls. Fall has just begun, but the air is still held by summer and it is warm enough for the evening to be enjoyable. The flower girls’ dresses are white on top, with skirts the color of dusty rose, and thick lavender ribbons are tied about their waists. The scene is captivating with carefully placed lights illuminating the space beneath the trees as day turns to twilight. The image looks like a picture from a fairytale. It is a tale of two young girls leading the way through an enchanted forest, waiting for the princess to follow the path they have laid out for her.